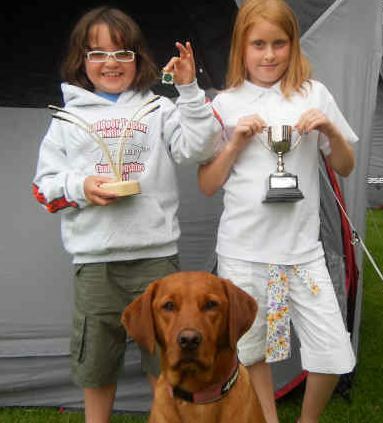 Hollie Smith (10) and Rebekah Lowe (9) took part in the Junior Fita Star and the Junior National Open Championships at Lilleshall on the weekend of 2nd and 3rd July 2011. It was a lovely weekend, with unbroken sunshine throughout and soaring temperatures. 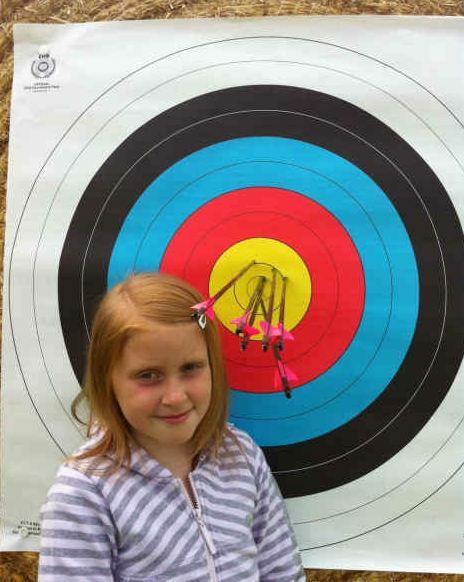 With 70 targets and over 300 junior archers competing over the course of the weekend it was an impressive sight if not a little overwhelming for two young girls who had never taken part in an Outdoor National competition before. Shooting the Metric V round on the Saturday, Hollie shooting a Compound Bow broke the existing national record for the 15m distance with a score of 337. She also broke the existing EMAS and Nottinghamshire County Record for the round of 1291 by shooting an impressive 1345 and was awarded the Willson Trophy. Rebekah shooting Barebow broke the existing National Records for the 20m, 15m and 10m distances and went on to further increase the National Record for the round she set last weekend at the Emas Double Fita Star, by 35 points, setting a new National, EMAS and Nottinghamshire County record for Barebow of 1053 and was awarded the Barebow Trophy. Lucy Mason who managed to put in a perfect score of 1296. Rebekah found the conditions on the Sunday challenging after her Saturday performance, but managed to complete the competition, achieving a silver medal place. Not a bad weekend for them both: 1st place, 2nd place, National, Regional and County records and in addition a purple Rose for Hollie and a purple Cross for Bekky. Sunday, Wilford Bowmen hosted the first of 4 County Selection shoots. As the archers set out on their long ardous trips to York, Hereford and Bristols, when Hurricane Wilford hit the city, stopping archers in their tracks. The shoot was abandoned after 2 1/2 dozen due to tents flying away, scopes falling over and bows falling off stands. A lot of bad hair-days were spotted arriving in the hurricane. The county would like to thank WIlford Bowmen for hosting the event, and helping to setup and packup the tournament in record time. Lets hope that we don’t get Hurricane Welbeck next weekend ……………….. ! Sunday saw the start of the 2011 Nottinghamshire County League shoots at Sherwood Archers. There was a good turnout with 23 targets. The weather held out all day, with a couple of spots of rain just before lunch. Our thanks go out to Sue Stankovic and the team at Sherwood Archers for hosting the day, which ran like clockwork. The next league shoot is on Sunday 12th June at Sherwood Archers. If you did not shoot this league shoot, you can still shoot the next two. As an adult, you will shoot at 60/50/40 yards for the full round, but if you cannot get to 60, shorter rounds are available. 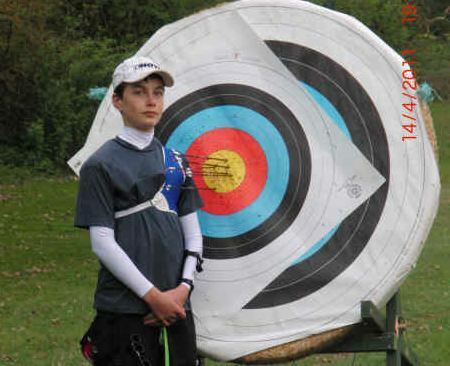 If you have not shot a tournament before, it does not matter, people around you will help you – I shot with a gentleman longbow who had only finished his beginners course a couple of weeks ago and had only shot at 60 yards the day before. He had a good day, enjoyed himself and is looking forward to the next league shoot. For more information, see your club secretary who will manage your clubs entries. The entry fee is £3. Congratulations to Les Smeeton of Bingham Leisure Centre Archery Club on being awarded the HartwelL Trophy at the GNAS AGM at the weekend. Les was nominated by Nottinghamshire and EMAS in recognition for his work with the English Archery Federation (EAF) Commonweath Games Squad 2010. Les was heavily involved with the setup, training and selection of the compound team.